The United States of America has warned the embattled President Yahya Jammeh of The Gambia, saying he is losing opportunities to peacefully handover to President-elect Adama Barrow and avoid the consequences of his actions. Spokesperson of the U.S. Department of State, Mr. John Kirby, said at a press briefing on Tuesday that Jammeh was putting his legacy and The Gambia in peril. According to him, the accusation by Jammeh of external interference in The Gambia’s internal affairs is not tenable. “I don’t know what interference he’s referring to, but we obviously want to see The Gambia succeed. The US had on Friday, indicated support for ECOWAS to take all necessary action on Jammeh if he fails to handover to Barrow. 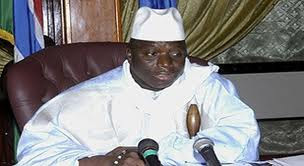 The US had regretted that Jammeh’s action had made the situation in The Gambia to become “very uncertain”. Kirby, however, said the US “believes that ECOWAS can certainly play an important role in providing security and addressing some of the concerns that there could be violence around the transition”. He also said that the US was not ruling out its support to a military action, saying: “We do, and I’m not trying to back away from that in any way, shape, or form. “I just would say that we do, obviously, support ECOWAS as a force for peace and security in the region, and specifically in The Gambia. “Well, again, I don’t want to speak to what possible actions they may take. I don’t want to get out in front of those decisions,” he said.